Before I left Turkey, and returned to Canada, I vowed that I would take the time to explore and rediscover the nation which I grew up in. In doing so, I wanted to ensure that I didn't overlook or take for granted all that was immediately around me in Toronto and the surrounding area. The moment I touched back down in Toronto a little less than a month ago, it immediately dawned on me that there was a wealth of experiences to be had here. I can't tell if in my younger years I took for granted what was always within my grasp or there has been a tremendous growth in the city and surrounding area during my extended absence, but it's clear that things have changed. I was fortunate enough to take this mindset to Durham Region which, for those who don't know, is located in Southern Ontario, just east of Toronto. However, I want to take a moment to stipulate that Durham Region isn't a place that just merely resides in Toronto's shadow. In stark contrast to that notion, I would argue that more Torontonians are actually moving out in that direction than vice versa at this point. Durham Region has its own culture which is seemingly strengthening by the day, and that's coming out in what it's producing from a food and beverage standpoint. I'd venture to say that's largely because the land is ripe for growing Ontario goods, and that's recently collided with some bright, creative minds who are looking to do some interesting things in relation to boiling, braising, and brewing. I spent two days driving around the region with a particular focus. Firstly, I was in talks with the Ontario Culinary Tourism Alliance to ensure that I was visiting restaurants which genuinely focused on sourcing locally, something that has become increasingly important to me, and always has been important to them. Their idea with their recent campaign is to recognize restaurants that put dollars back into the pockets of Canadian farmers, but also delicious, fresh food in the mouths of happy patrons. The monicker for their campaign is known as "Feast On," and you'll likely want to take note of the restaurants on this list! My secondary goal was to do a thorough job driving throughout the nearly 2500 square kilometre region, finding innovative and interesting destinations to stop, such as breweries with a propensity to push the boundaries. For reference sake, the Regional Municipality of Durham includes the Town of Ajax, the Township of Brock, the Municipality of Clarington, the City of Oshawa, the City of Pickering, the Township of Scugog, the Township of Uxbridge, and the Town of Whitby. In short, this post is my attempt to do homework on where to eat and drink in Durham Region so you don't have to! What I found, experienced, and discovered is worth recounting (at least in my humble opinion). Now, it goes without saying that there are more than two restaurants that are worth visiting in Durham Region, but these are two restaurants which embody that farm-to-table, focus on local sort of esteem. Beyond that, these two restaurants provide innovative meals at attainable prices. It's also worth mentioning that, not surprisingly, they're both "Feast On" Certified. Riddle me this - how many times have you sat at a restaurant in which you're literally looking out over the farm where the food came from? Bistro '67 describes themselves as providing a "farm-to-fork" experience. I thought a gentleman I spoke to after who worked with the college summed it up well when he noted, "everyone talks about the 100 kilometre diet or the 100 mile diet, you know eating food within that distance. Forget that, we're all about the 100 foot diet." I should backtrack and explain the connection to Durham College. This restaurant is actually inside Durham College's W. Galen Weston Centre For Food (CFF) and, as such, it's a place for both skilled staff and students to flourish. When you sit down you can clearly see it's a dining experience that is well crafted, but the menu choices and design have been thoroughly discussed, with a number of different voices having a seat at the table. I was lucky enough to be served by Caitlin who was upbeat and knowledgeable. With her kind guidance, to drink I chose the "Lemonberry," which was a blueberry reduction, lemonade, and Vivreau sparkling water, and hit the spot as far as refreshments go. In fact, that beverage was a precursor to my first course, which was equally refreshing in its own right, and kept to the berry theme. The DC (which stands for Durham College) Berry and Pecan Salad was everything you think it might have been based on the picture above. 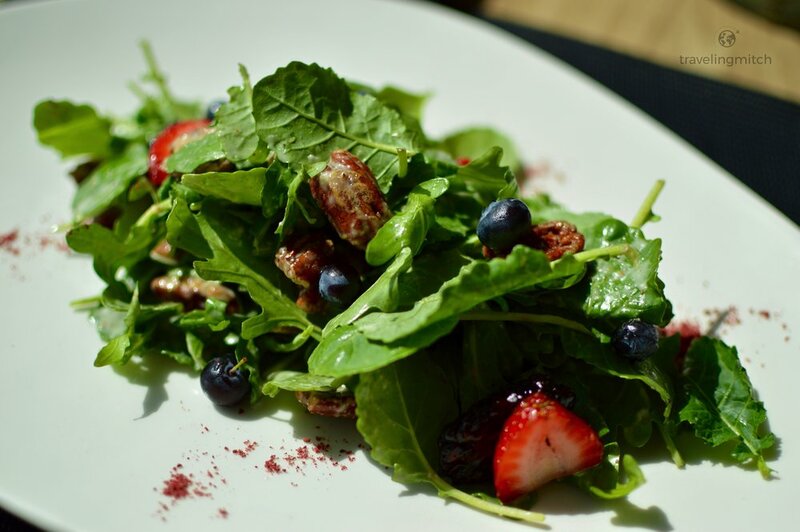 You've got greens from the farm out the window, fresh berries, toasted candied pecans, chévre, and a maple-thyme vinaigrette. My second course at Bistro '67 was a photographer's dream and a foodie's paradise. 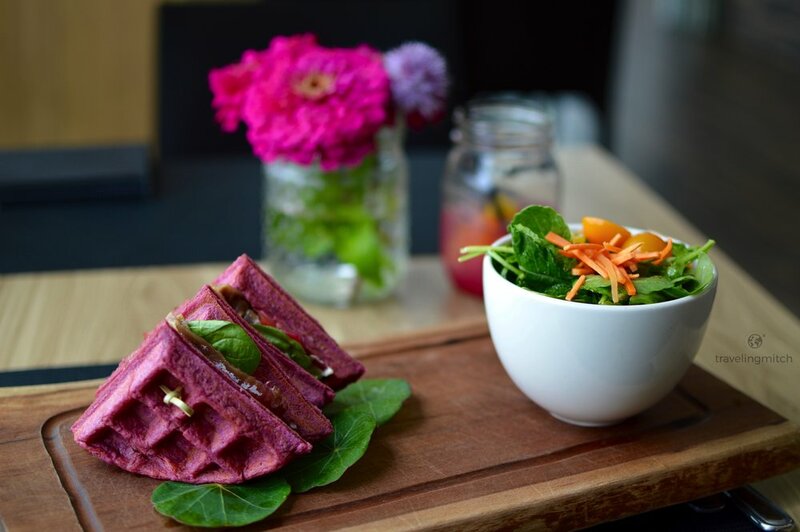 I had the Beetroot Waffle, which was filled with smoked and cured Atlantic salmon, chive cream cheese and just a hint of lemon with some fresh greens on the side. It was a slew of different yet highly complimentary flavours. At the end of the meal, I took a tour of the kitchen with Raul Sojo, the executive chef of Bistro '67 who was brimming with passion and excitement. We glanced in the fridges, and breezed past stovetops with boiling pots and the smell of food cooking every which way. There was this wonderful moment when he was showing me a particular fridge and took out a handful of beets and other greenery. He looked at me and said, "I'm so proud that we aren't dealing with frozen foods. Right now, 80-90 percent of our foods are coming from those beautiful fields right over there." Raul Sojo, the executive chef of Bistro '67 with a Durham College student in tow. When I left the kitchen finally, I walked out and behind the bar and noticed they were pouring beers aplenty. It turns out they'd done a collaborative beer with All or Nothing Brewhouse. So, of course, I tasted it before departing. For me, it was more emblematic of the fact that Bistro '67 seems to be ever changing and evolving, and it was a nice feeling to know that the next time I return there'll almost definitely be a lot of new items on the menu. There are times when the name of a restaurant just doesn't match the vibe. Well, that's not the case here. You've got a slick trendy, urban feel, but also present is the homestyle feel or comfort derived from the word "pantry." It sits pleasantly right off Uxbridge's main drag, and it both fits in and stands out. Ultimately, it was a nice welcoming decor with a kitchen more or less open to see chefs hard at work, but, for me, it was what the chefs were actually working on that won the prize. Not to mention the fact that the folks working there were sweeter than Ontario peaches. And their wine and gin selection was nothing to scoff at either. At Urban Pantry, I dined on the Scottish Soda Bread, which had just the right amount of herbed butter spread inside, and just the right amount of carmelized pepper jelly sitting beside it. Next up was the Eat it Forward option, which is a dish designed for the menu by Miranda Malisani, who owns the health food store by the same name not far from Urban Pantry. She's a regular guest on the Marilyn Dennis Show on CTV as their resident nutritionist, and she typically creates a dish for each new menu they put out at the restaurant. This month's Eat it Forward dish was a salad with organic greens, pickled farmer vegetables, cabbage, raw nuts and seeds, hemp hearts, a healthy portion of seared tempeh, and an apple cider and fermented mustard dressing. I felt pretty fantastic after this course. For the second course, I wanted to do something a bit different, so I went with the Pork Belly + Egg, which was very much as it sounds. 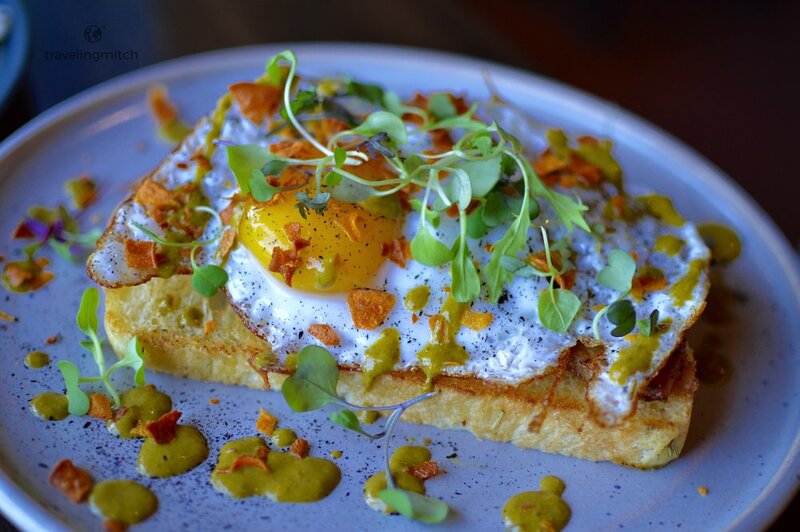 It was a slow roasted pork belly, a sunny side up duck egg, chimichurri, sweet potato crumble, and focaccia bread. I've got to say once the egg yolk was disrupted and it more or less poured over the dish, things got pretty darn delicious. I got the sense that this dish was a fan favourite, and for good reason. Georgia, my server and part-owner with her sister, explained that their menu was seasonal and that was because of their insistence on changing their menu in sync with the harvest of the farmers around them. It's funny that something like that can strike us as so innovative or inventive when that's really what all restaurants should be doing. But, of course, the reality is that they aren't, and we're in the era of frozen food and fast food, which means we can't take places like Urban Pantry for granted. 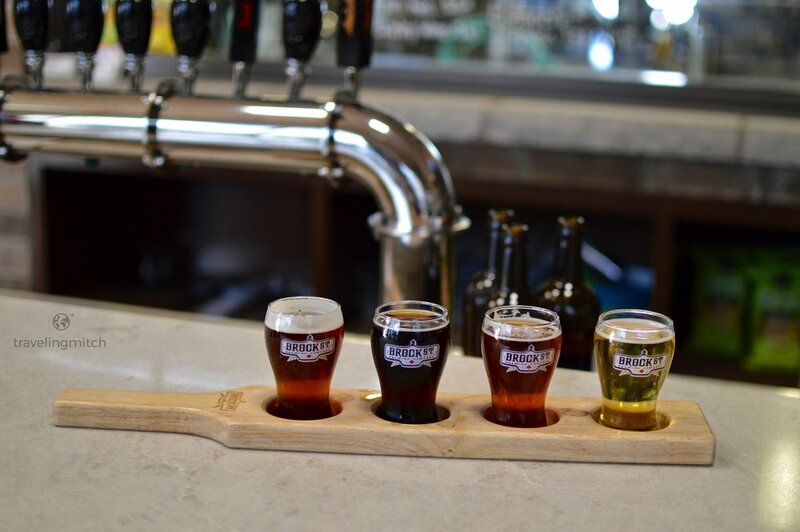 Breweries and Wineries in Durham Region That Are Worth Stopping By! From the outside, you wouldn't necessarily know what a beautiful operation they've got going inside. That being said, they're making moves, and they have plans to open up a top-notch brewpub by next summer complete with a larger brewery with can be toured, a banquet hall, and an outdoor patio. All that to say, it's worth watching out for this brewery because my feeling is they're about to get a lot better known. I spent a fair bit of time in the back, checking out the brewing process with Dominic, who is their head of operations and sales. It's clear they've come a long way from humble beginnings, but they've got some hefty ambitions on the horizon. Not to mention, while I was sitting there, there was a nice amount of traffic coming through, with the owners knowing most people. I asked Mark about this, who happens to be one of the founders, and he spoke about how much Brock St. wanted to be a contributing member of the community and really give back. He also insisted I try some of the homemade root beer (and we're not talking A & W, folks), as well as some of the homemade salsa with Trinidadian ghost peppers, and scotch bonnet peppers with pulverized seeds, sautéed peaches, and vinegar. It was my first indication that the ownership here was committed to trying some new and interesting things. At this point Brock St. is producing about 500,000 litres of beer a year, which sounds like a lot, and it is, but they say they've got their eye on bigger production. Production doesn't mean anything though if you aren't producing anything of value, but luckily Brock St. doesn't have that problem. Dominic walked me through a little sampler that he poured for me which included their Blonde, Amber, Irish red, and a quirky little beer known as the Pineapple Express IPA. They were all quality in their own right, but I had a special affinity for the Irish red. Brock St. Brewing Co. in Whitby, Ontario. From right to left - blonde, amber, Irish red, and pineapple express IPA. From what I can gather, it was really 5 Paddles that started this craft beer movement in Durham. It's interesting though, as breweries began to sprout up around them, it seems the craft beer community just got larger and more supportive, as opposed to vindictive and competitive. I like that. Want to hear about a staggering fact? 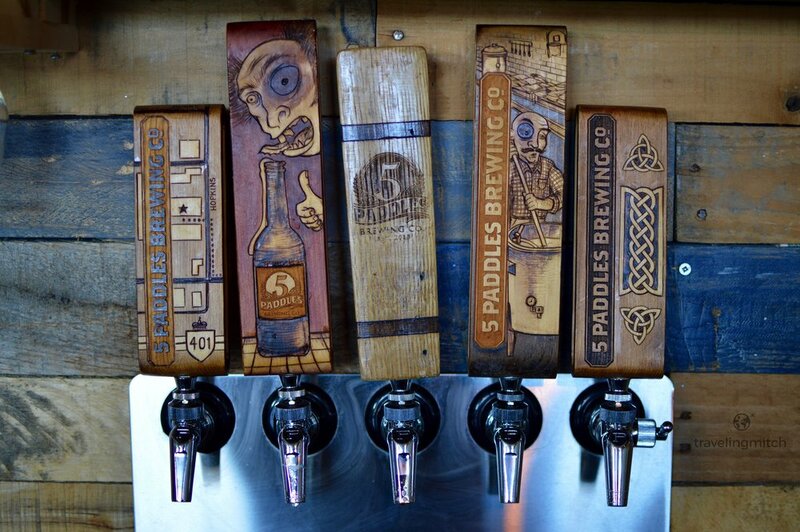 Since they opened up in June of 2013, 5 Paddles Brewing Co. has made and sold more than 160 different beers! How's that for a commitment to experimentation? That does seem to be very much what they're all about though - trying new things and keeping around a few staples that are tried and tested to appease their client base. They've got one particular beer now, Home Sweet Home, which is their crown jewel so to speak, and it's making its way into LCBOs and other distributors around Ontario, so watch out for that one! I can personally attest to the fact that it's delicious. It's a honey vanilla wheat beer, so what's not to love? I was lucky to get a tour from one of the founders, Ian. He was equal parts kind and hilarious, and he gave me some insights into the 5 Paddles's journey thus far. I could tell he was proud of all that they had done (and they should be), but he also said with a wide smile, "I always tell people when they say they want to open a brewery. Okay, if you really want to open a brewery, first take a year and travel the world and drink all the beer you can. Then come back and see if you still do, because at the end of the day that'll still only cost you about a tenth of what opening a brewery will!" I think he has a point, but I never got the feeling that he'd rather be doing anything else. Of the breweries I visited, I think it's safe to say that 5 Paddles had the most eclectic beer selection available. To go along with Home Sweet Home, they also had Valley of Darkness, a sour imperial stout aged in a red wine barrel, Skull Pucker which is a sour IPA, Italian Backyard, a basil pale ale, and finally Strawberry Wheat which I don't think requires any further explanation. Frankly, any brewery that is going to serve me beer in a mini-canoe is going to steal my heart. This little known winery isn't actually all that little with over 100 acres to their name. Also, I quickly found out that they have a fairly devoted and widespread following. Ocala isn't all that far from Port Perry, but it does indeed feel world's away from everything else. You've got a gorgeous old dairy barn which has been converted into a quaint shop, and sprawling orchards which produce a wide array of fruits and grapes. One thing I did notice there was that they certainly weren't scared to dive deep into the world of fruit wines, their kiwi wine manages to exemplify that pretty darn well. Though, I'll admit, it was the apple wine which really won me over. 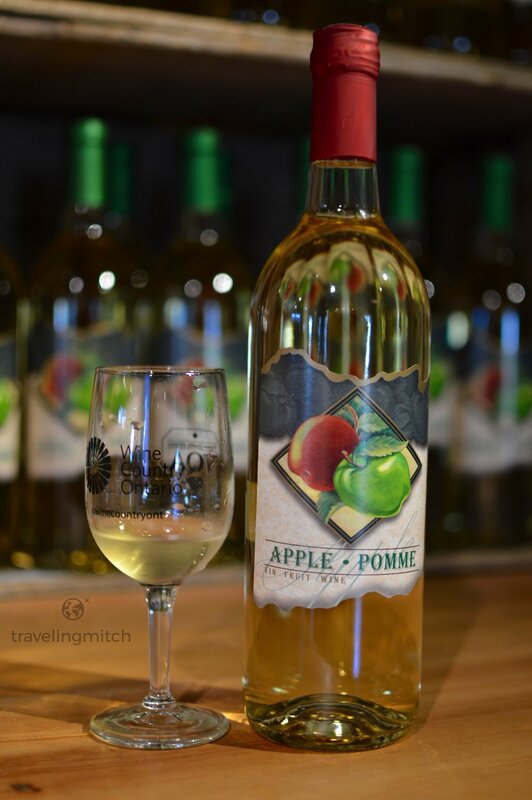 Ocala Farm Orchards Winery has recently come into new management after three generations of being under the helm of the Smith family. The new family has just taken over months ago, and they seem keen to learn from the Smiths and to carry on their legacy. It's an exciting time for this place which literally uses land around it to produce fine Ontario products. While I was there, I did some tastings. As with nearly every other place I visited in Ontario as far as breweries and wineries are concerned, they did things their own special way. I tried a very dry apple wine known as Marquette Red, which was a dry red with a unique flavour. Next, the dry white using La Crescent grapes, which were planted after the ice storm about a decade ago as they're known for their resilience in harsh climates. Their Rosé was personally my favourite as it was accented with fresh peaches - I may or may not have bought a bottle on the spot. The Ambrosia was the runner-up for me, as it was an apple wine done right. Finally, I just had to try the Kiwi, which had a strong flavour of the fruit, but in an unexpected way. It's a nice wine to try, but drinking a full bottle might be a tall task. Drinking the wine was lovely, but perusing the orchards was even more so. 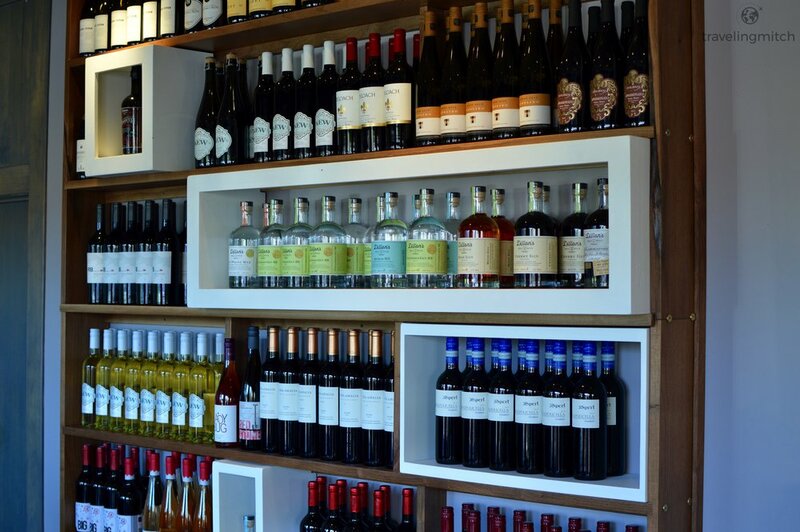 If you're looking for specialty wines and a winery that has a more intimate local feel than what you might find in Prince Edward County or Niagara, then this might be your best bet. The Second Wedge Brewing Co. Simply put, Rob and Joanne run a wonderful little brewery in Uxbridge. I felt very fortunate to chat with both of them for a while inside Second Wedge, as they talked about their home-brewing passion turning into full-time business. Yet, calling it a business devalues what they do, I think. They support local artists and art exhibitions by displaying work on their walls, they've hired a chipper group of young, knowledgeable staff to take care of customers, they host a weekly farmers' market in their parking lot, they host parties in their back area for the community at large, and, on top of that, their beer is fantastic. It also never occured to me that they ran Second Wedge to turn a profit, but rather to take their beer making to new levels, and see where they ended up. So far, so good. They talked about wanting to make beers that were filled with character. I got the feeling that they were fine being inspired by other beers they had tried, but they were looking to make something you could only find by stepping in the doors of The Second Wedge Brewing Company. When I was there, naturally I had to taste some beers for myself. On tap that day, they had the Elgin Blonde, which was like your normal blonde, but it actually had a respectable kick of hops in the aftertaste. The Monday Night Piper was made with British malts and earthy hops. The Rain Maker was easily their most complex and robust beer, and had deep flavours of coffee and dark chocolate. 3 Rocks was basically hops and grapefruit colliding in one glass, and High Grass was their lemongrass ginger saison. If that wasn't enough variety, they had a seasonal Smoked Wheat on Rye that was love at first sip for me. They seem to have no shortage of events upcoming, so I'm sure I'll be back up there sooner rather than later, if only to get my hands on that Smoked Wheat on Rye before it runs out! If there was one constant, it was that there was an emphasis on locally sourcing what was being used to cook food, brew beer, and make wine. It seemed to be unanimously important to everyone I spoke to that they bought or produced locally, but also thought about how they could interact and give back locally. Everyone was concerned about doing things the right way, not the more inexpensive way, and that's worth respecting. My forays through Durham were a kind reminder that there's plenty worth eating, drinking, and doing in the region. It's a mistake for some to think of this region as "near Toronto," when they clearly have a strong culture, heritage and future of their own. The beauty of today's world is that you don't have to take my word for it, you can click on any of the places I mentioned and be taken to their website to find out more. You can form your own opinions which, in my opinion, would be well worth the effort. These aren't restaurants and breweries run by corporations, they're run by real people, who use real ingredients, and deserve real recognition. This post was a collaborative effort with the Ontario Culinary Tourism Alliance and the Durham Regional Tourism Board. The opinions expressed are my own. In the comments below, let me know what you thought of the article. Have you been to any of the six places outlined? If not, which place really sparks your interest? What are you feelings on Durham Region at large? 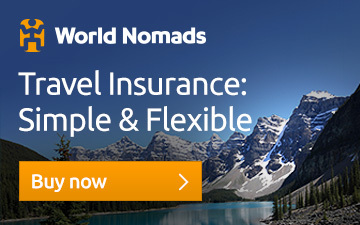 Have you been there, or would you like to go? Any and all comments are welcomed and appreciated, and, as always, I do take the time to answer each and very comment individually. If you liked this article, don't forget to pin it!